President Maithripala Sirisena addressing the ‘Presidential Media Awards 2019’ at the BMICH yesterday. 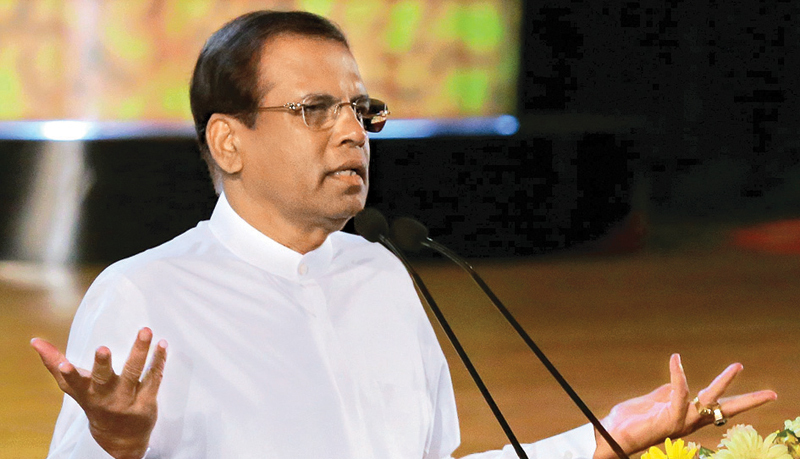 He used the platform of Sri Lanka’s first ever ‘Presidential Media Awards 2019’ held at the BMICH yesterday to caution media personnel against scathing criticisms on him stating that the alternative leader who would emerge as a result would be his “opposite” and prone to more drastic measures to control the media. At the outset of his speech, the President acknowledged that it was Finance Minister Mangala Samaraweera, who pioneered the ‘Presidential Media Awards’ when he was the media minister. He said Samaraweera rendered a great support to make this event to be a success. The President said that he would consider restarting the discussions on the royalty payments. This would be done taking a request made by veteran Artist Lushan Bulathsinhala at this awards ceremony into consideration.